Dear Aspirants, as all of you know Bank PO jobs is one of the reputed profession in our society based on the PO job benefits and emoluments. So Bank PO job is more popular in all the graduate candidates. Every year, PO recruitment is announced by various recruitment board/ bank like IBPS, SBI, and other banks. The competition is exponentially increased in recent days; because huge numbers of candidates are try to grab the Bank PO Jobs. To crack Bank PO exams, aspirants, must to make enough preparation. Usually, Bank competitive exams are framed to check candidate’s problem solving ability, time management and decision making accuracy. So aspirants have to brush their skills towards these terms to clinch success in Bank PO exams. PO recruitment notice for various banks will be released throughout the year; ergo this is the right time to design your career in Banking Sector. Before making your first step, candidates can go through the tips to crack IBPS, SBI & other Bank PO jobs in 2019. Here we have provided tips to grab the bank PO jobs from great extend the analysis of previous year recruitment. For Bank job, skills is more important, first you have to analyze your ability and skills. If you find any lagging in skills you may plan to work on it. Self-Analysis is being good initiative for all the successful achievement. Many candidates may strong in problem solving concepts, but they may fail in either time management or accuracy, though the competition is tight they have to concentrate on all three ability. Candidates must have to assign timings for solving questions in each topic. To achieve three important factors of bank exam Problem Solving ability, time management, and accuracy, aspirants should have to practice with Mock Test. Candidates those who priory start your preparation before recruitment notice, they have to alert in recent Bank PO recruitment drive. Once the recruitment notice releases, aspirants first go through the notification and come to clear understand about age limit, educational qualification, selection procedure and most important syllabus and exam pattern. After that you can make your registration before the registration rush period that is before 10 days from the last date. Before start your preparation, candidates must have to know about their category cutoff in previous recruitment, this analysis creates benchmark for you. 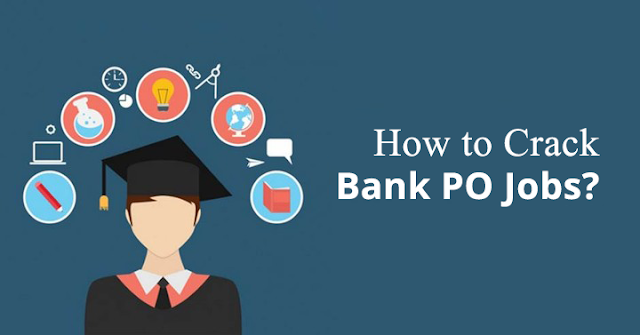 Make your preparation to cross the benchmark score in your Bank PO exams. One can achieve their goal means, they have to do hard work as well as smart work. For that smart work, candidates must have to compile effective study plan based on previous bank PO exam analysis. Allocate more time for topic/ section in which you are lagging. Be aware to choose the study materials and mock test which will be back bone of your preparation. Analyze trustworthy website before choose your study materials and make your preparation based on the study materials. Validation is most important part in the success path, because it will provide your current position in the competitive exams. For that candidates should have to practice with mock test which is especially prepared based on the new exam pattern and exact syllabus. If you find some lagging in your preparation or skills from validation, you can rush your preparation before the examination. Making ourselves more ability before examination is significant to clinch the victory. Last but not least, confident is the key factor to open your success. Yes once you done the above four thing you have to be confident about your exams. To build the confident, avoid the tension, nervousness about our exams. This confident make you to find the answer with high accuracy. Tension makes you more complicated. So before enter your exam hall, makes your mind clam and clear. Surely these things will take you to success in Bank PO exams. Yes, that’s it, We hope the above tips to crack your bank po exams will enlighten your idea about the Bank PO Job. Do work hard and practice, surely victory will come on your side. All the Best Guys!! !